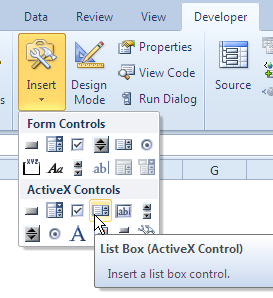 To make data entry easier, create lists with the List Box control. Check one or more of the items, and add the selected items to the worksheet. 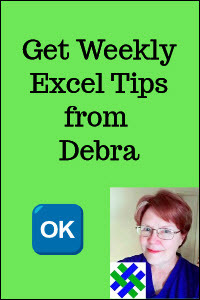 In an Excel worksheet, you can create lists by using the List Box control. In this example, the worksheet has a List Box control that allows multiple items to be selected, and there is a check box at the left of each item. This ListBox shows the entries from a named range -- DaysList, that lists the five weekdays. On the worksheet, draw a rectangle with the List Box tool, to create the List Box. 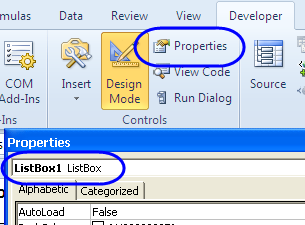 With the List Box selected on teh worksheet, click the Properties command on the Ribbon's Developer tab. The Properties window will open. 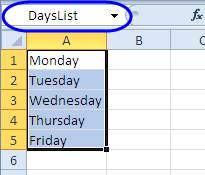 In the Properties window, for the ListFillRange setting, enter DaysList -- the named range with the weekdays. 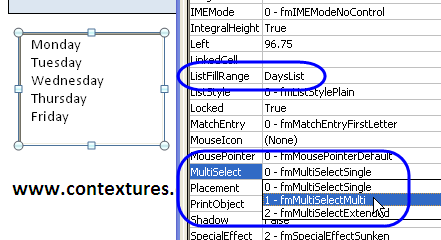 Click in the ListStyle property, and from the drop down list, select 1-fmListStyleOption. This adds check boxes to the left of the list items. In the List Box, click one or more weekdays, to select them. 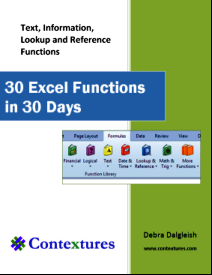 If items have been selected in a List Box, you can use Excel VBA code to extract the selected items, and copy them to cells in the workbook. In the following example, Volunteer information is being collected. The name and city for each user is entered on the worksheet. In the List Box, the weekdays that the volunteer is available are checked. The volunteer's Name and City are copied to the database sheet, and the current date and user name are entered in columns A and B. 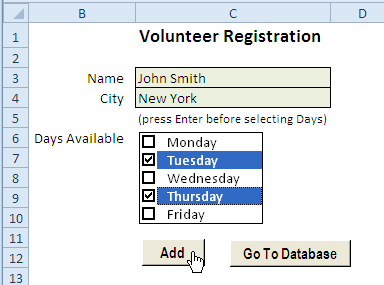 The days selected in the List Box are entered in the same row, starting in column E.
Here's the completed Excel VBA code for the Volunteer Registration data entry form. It copies the data to the database sheet, then clears the data entry cells, and the List Box. 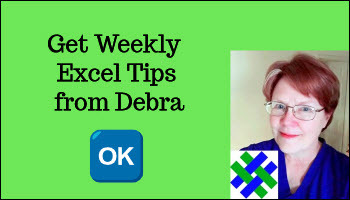 To see the steps for creating a List Box on the worksheet, please watch this short Excel video tutorial.